along with up to two photos, by clicking “Add Your Memorial” above. Please include your pet's name, year born & died, (if known), and best quality uncropped photos. We reserve the right to size and/or crop them to fit page space and respectfully edit text (spelling and grammar errors, etc.). Like you, we have also lost animal family and offer our condolences for your loss. We hope this commemoration will help bring you comfort. I know that all our dogs are always the best you have ever had, but Shep was an absolute gem of a dog. We adopted him from BCIN in a very “locked down” state, fearful of even the air around him. We only fostered him in the very beginning, as I felt I hadn’t mourned our previous dog for long enough, after we adopted her at ten years of age. However, Shep crept into our hearts and will forever stay. 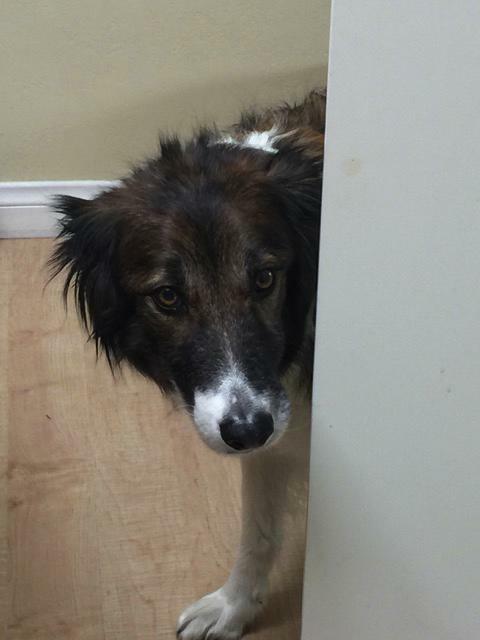 From being the fearful BC – the UPS truck was his nemesis! He became a Masters Agility Dog. 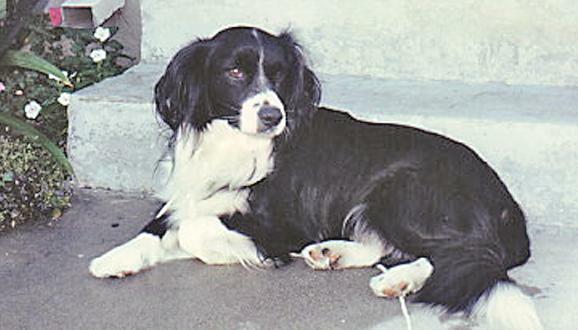 We had many summer vacations on the beach at Cambria, which he loved, and playing in the back yard with the always-available tennis ball. In fact, only a week before he passed away, he was playing catch with Derek. He was the most gentle soul I have ever met in a dog. He loved our little granddaughter and anyone who came into the house. There wasn’t a mean bone in his body. We miss you my gorgeous boy, but I know you are running and jumping waiting for both Derek and I at the Rainbow Bridge. Love you forever Sheppie. for my husband. Whenever he was down, she always helped to cheer him. What a wonderful sweet and gentle soul she was. He was the sweetest, kindest, most beautiful soul. A true Mama’s boy but there was a lot of mutual love and affection with his Dad also :) We had many fun adventures together. We tried sheep herding but he was nervous around the sheep, we tried agility but he didn’t take to it (we found out later that he had been born with hip issues, which explains why he didn’t take to the agility). to chase tennis balls and we’d do that daily at the dog park where he’d also play with his friends & siblings). We took him on a “just for Merlin” trip to Santa Barbara last summer. He has joined his brother Coby (a Lab mix) whom we lost to cancer last year, and his sister, Sophie, whom we lost to old age six years ago (she was a senior rescue, 9 when we adopted her so we only had 4 years with her). Merlin is survived by his younger sister Ellie, a cattle dog mix. He’s been closely monitored by his Dr for years and especially closely this last while. His kidneys were starting to fail him and his hips were giving out. On Saturday he was unable to get up without assistance and we knew it was time to let him go with dignity and without suffering. We carried him to his favorite local park for one last visit and offered him his favorite treat. Dearest Gracie ~ Your beautiful little self came into our lives on February 14, 2008 and healed our broken hearts with your love. April 1, 2017 when, after a short illness, we held you and told you we loved you as you drifted off to the Rainbow Bridge. we will come for you at that beautiful Rainbow one fine day. I got Rocky (Robby before) back in 2009. He was on your website and I picked him up in Rancho Cucamonga, CA. I wanted to rescue him so he could play with my older Border Collie, Lenny. They were good friends. a baby border collie/lab. She is a sweet heart. She loved Rocky. like he was telling me to send him to heaven. I told Dr Bowman to administer the shot. It only took a second and Rocky was at peace. before he passed. Please put him on Rainbow Bridge. I though you might like to know what happened to me. 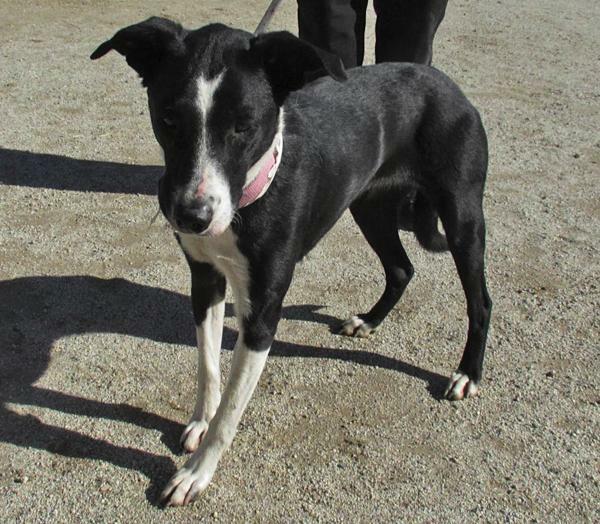 I am a female black and white smooth coat Border Collie approx 1 ½ years old. I was found on 12/3/2015 in a field in Riverside and brought to the Riverside Animal Shelter. I was terribly frightened, trying to make my way on the street, not knowing where I was going, trying not to get hit by a car, hungry and in pain, picked up by Animal Control, put in the kennel listening to slamming doors, dogs barking and all I wanted was to go home. Somebody loved me. I knew all my basic commands and was very lovely. I came in with a cute pink collar with a big metal buckle. When you found the hard mass on my bottom right jaw, you took my tags off and set me on the street to fend for myself. Yesterday, Sue Hooper from Border Collies in Need picked me up at the shelter and brought me some soft cooked chicken for breakfast while we listened to Christmas music on the radio and she transported me to Suzanne Strauss for my much needed veterinarian appointment. After my x-ray, Suzanne cried as they found the bone tumor was now encompassing ¾ of my jaw, had been bleeding and even pushed a lot of my teeth out. It has been causing me a great deal of pain for a long, long time now. Suzanne held me and told me she loved me and that I was a BCIN dog forever and that she was so sorry as they gently put me to sleep in her arms. Yesterday, I was at peace and found love again. Please be a responsible pet owner especially in their time of need. You are all they have. Trooper was born in March 2013 and died March 15, 2015. 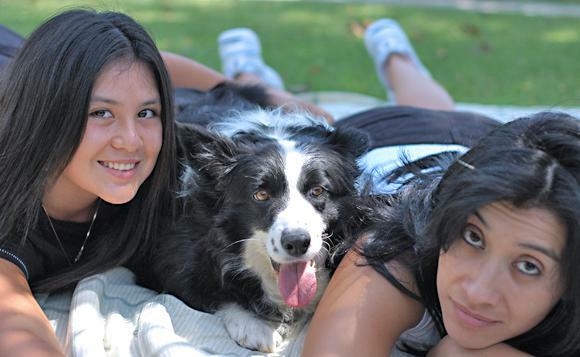 A tragic accident on March 15 stole the life of our beloved dog Trooper in an instant. Trooper was an absolute sweetheart and a much loved member of the family. He was gentle, energetic and fun loving. As his Mom, I cherish memories of walks, the toys he brought me to engage in play and his Romeo moments (he liked to gently rise up on his hind legs and hug you). This loss is deeply painful for us. Many thanks to neighbors and the Dublin Ranch Dog Club for their notes of sympathy. We know time will make the grief fade to memories of joy but for now we grapple to fill empty days and hearts. Trooper is survived by cat Bamm Bamm who also misses Trooper and Trooper's daily antics like stealing his cat food. This afternoon Steve and I had to say good bye to our sweet foster Maddie. She was 11 and it was decided that her age was against her surviving surgery for bloat. It's a very difficult surgery under the very best of circumstances. She was a very special old girl, who had been badly mistreated before coming to BCIN. It was a honor to love and spoil her the last 4 and a half months. She is now free of any pain and no one will ever mistreat her again. She took a part of us with her and left many precious memories with us. Love you Miss Maddie, fly high and free! Thank you Suzanne for being with us as we said our goodbye; she was surrounded with love. For more information about bloat, please visit this link from ASPCA. What a character you were, little Snark. You brought us joy every day, with your spunky antics and eyes full of mischief. We fell in love, thunderstruck, the first time our eyes met through bars at the shelter. You barked more loudly than everyone else, "Pick me! Pick me! ", you yelled enthusiastically. Silly Puppers, you already knew there was no other choice for me. You bounced into our hearts as willingly as you hopped into the car, and will remain there ever more. We miss you still. 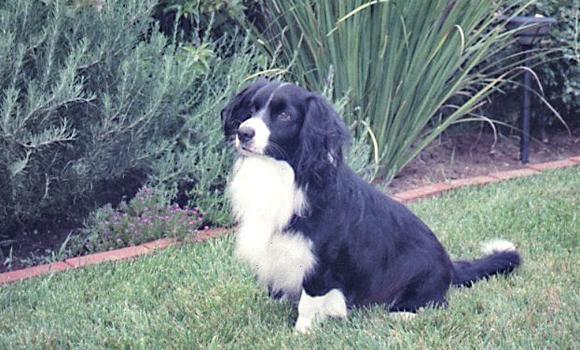 In memory of Carol & her family's Black & White Border Collie, Buster, born September 28, 1995. Buster went to Rainbow Bridge on August 13, 2008. His feline sister, a black minx cat named Bayer, born March 17, 1991 went to Rainbow Bridge on July 30, 2008. 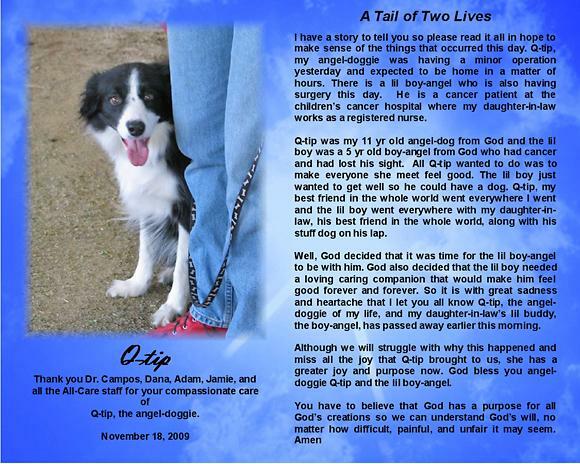 We hope this memorial brings her comfort in knowing that they will meet again at Rainbow Bridge. Some of you know I pulled a very geriatric LH Chi awhile back. Not to adopt but to give sanctuary. A nice, warm, soft place to die, where food and love were plentiful. Listed at 10 years old, he was painfully thin and frail with a skin condition. Poor little guy was weak in the back end and his teeth worn down almost to the gums. My vet estimated him at 20 years old, though kindly listed him as 15 on his sterility certificate. I named him Moses...old as dirt. Mo as I fondly called him was always a happy little guy. He'd get wagging so happily he'd loose his balance and almost fall. He gained some weight and the oily, flaky skin was gone. He loved to give kisses and it was hard with his advanced periodontal disease, but I would let him shower my face with those stinky kisses. He was a ray of sunshine in a world that can sometimes be dark. When I was frustrated with rescue, adopters, or a difficult foster Mo was my 'go to' guy. He always made me feel better about my chosen path. He could always make me smile and ground me back to why I do this crazy job I do. This morning as I was racing to get everything done to leave for Bow Wows and Meows, he just seemed a bit slower to rise from under his blanket. Tony said he was sunning himself, warming his ancient bones on the brick patio and just went to sleep about noon today. Quietly, without any struggle, he slipped over the bridge. He left me about the time I was in a flurry of adoptions. I wish I could have been with him. I'm sorry to tell you that Farrah has passed away. In early August she went into cardiac arrest and was not able to be revived. We were told she had been living with a congestive heart for quite some time. I wish we would have known sooner...maybe we could have helped her. It has been a sad time for us for some time now but have so many great memories of our beloved Farrah. She brought so much love and joy to our lives. August 30th 2009 would have marked our first year with her as that was the day we brought her home. We still celebrated that day with so many memories of her, even if for a short time. I want to thank BCIN for allowing us to have her in our lives and for the great work you are doing in providing homes for these loving dogs. I am attaching some pictures of miss Farrah for you. Isn't she beautiful! 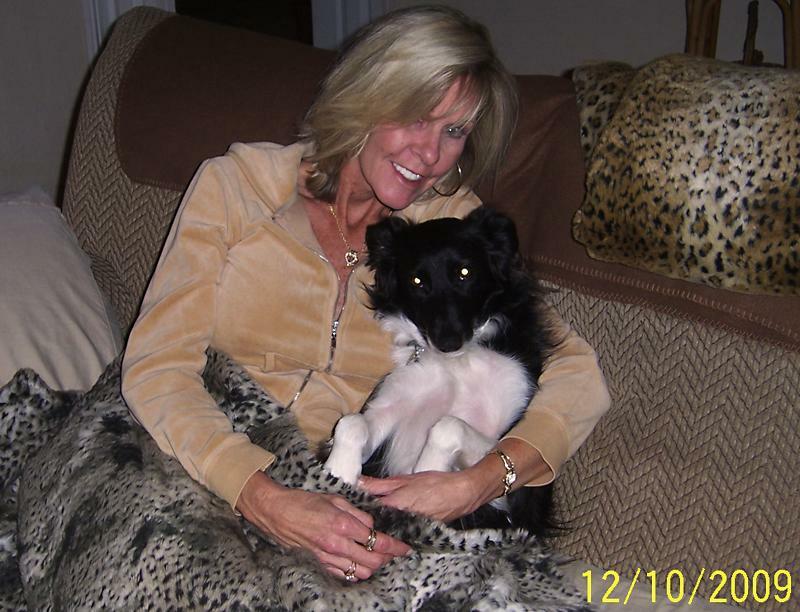 Our beloved Farrah who brought so much love and joy into our lives, gone too soon but FOREVER in our hearts. We love you Miss Farrah! When my mom and I bought a Border Collie puppy and brought him home for my dad, it was a surprise for him, and when he went outside to the patio, out runs this little black and white ball of fur from under the patio table that ran around his legs. Turns out Chucky was a mischevious little thing and that took to moving patio furniture and burying stuff. As he got older and stronger, he even decided to bury my dad's weed whacker! My parents could hear him driving my nephew's Big Wheel around the yard at night. Chucky was no ordinary dog. He had an awesome personality and brought lots of joy in our lives. Toward the end of his life as we noticed gray hair taking over the black color in his face, it was amazing to think eleven years had already passed since we first got him. A few weeks ago, Chucky got an infection that affected his kidneys and he had to be put to sleep. My dad had to make the hard decision because even though Chucky belonged to all three of us, he was my dad's dog, and my dad didn't want him to suffer. He is now moving furniture and driving Big Wheels in doggy heaven and having fun. We love you Chucky, and we will miss you very much. 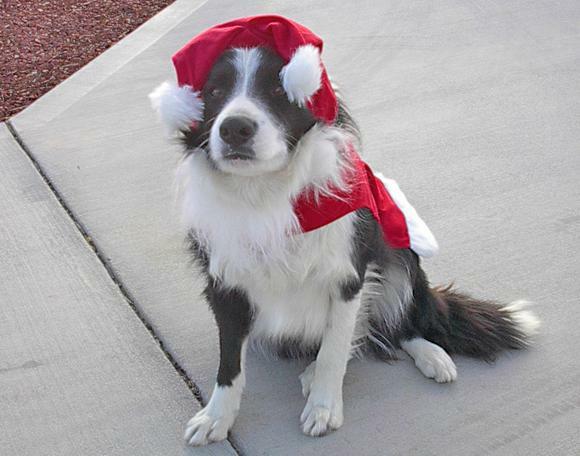 It was Christmas of 2009, and Chevelle was looking forward to another Christmas holiday season with her humans. 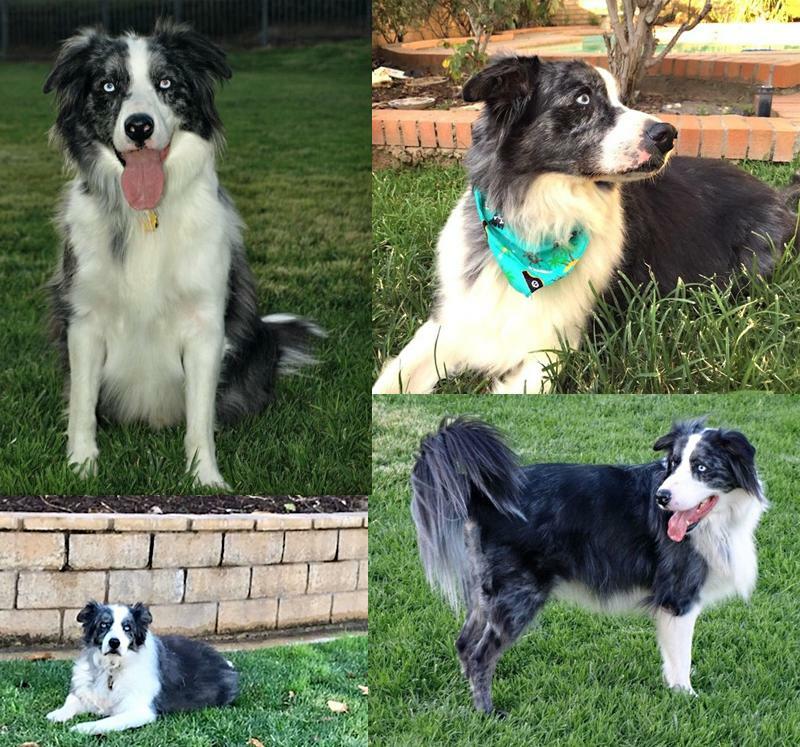 Instead of the gift of love and tennis balls, Chevy was relinquished to Border Collies in Need after spending the first six years of her life in what she thought was her forever home. 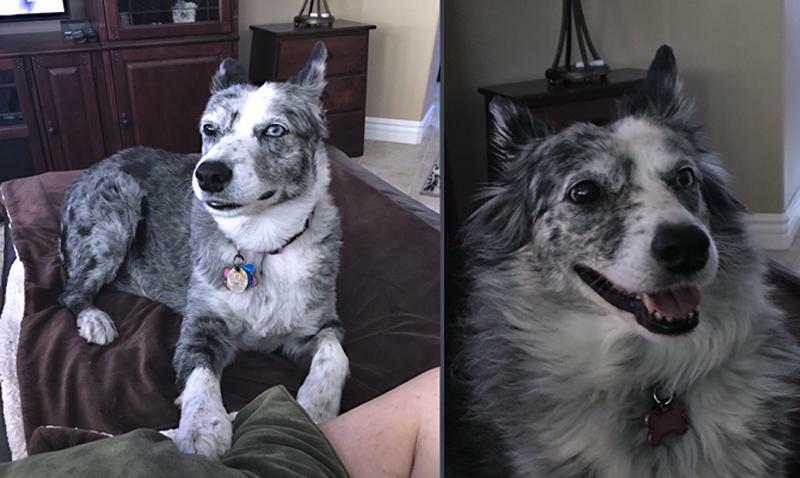 Chevelle, a gorgeous 6 year old Border Collies was shaken to her core, and she was full of every negative emotion imaginable. She was broken. Scared. Angry. Confused. Lonely. Disoriented. It took Chevy months to warm up to her foster mom, and even then she was un-easy about her foreign surroundings. Chevy would travel with her foster mom from adoption event to adoption event and she would barely get a second glance from potential adopters. She was broken. 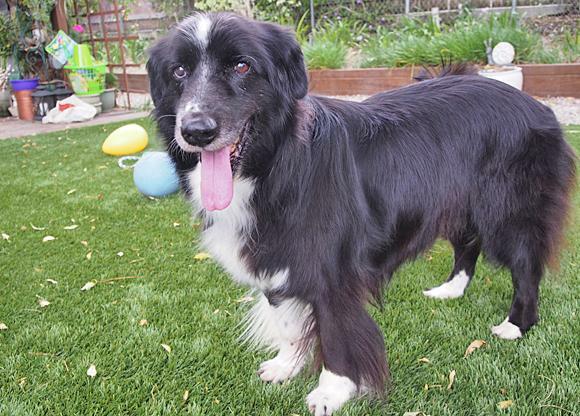 Months went by, and Chevelle still had no humans to call her own and looked destined to spend the rest of her adult life in rescue with Border Collies in Need. 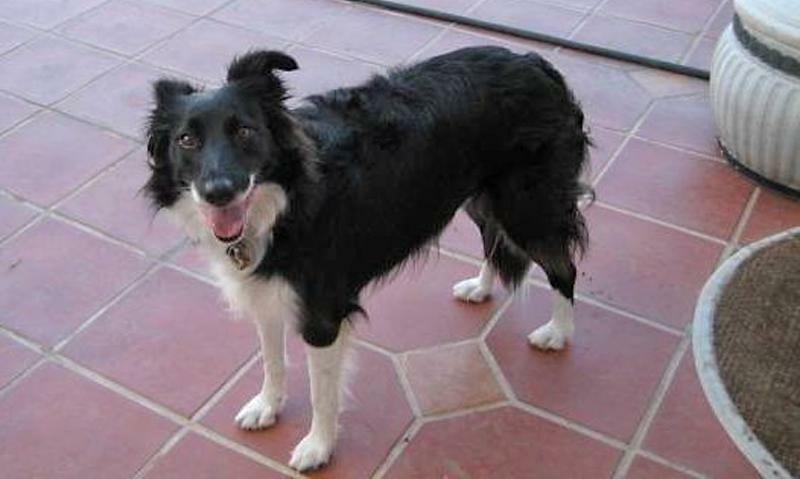 But, just when it seemed as tho all hope was lost, a family saw her photos and bio at Border Collies in Need website, and they were hooked. You see, this family had a dog that was the spitting image of Chevy who was a therapy companion for their son, who suffered challenging disabilities as a result of a motorcycle accident almost a decade before. Her future adopted family met Chevy and knew they had found their new best friend, and Chevelle, little did she know, was about to find her new forever home. Chevy took to the her new family instantly, it was love again for Chevy. So 364 days after she was relinquished, Christmas of 2010, Chevelle was happily welcomed into her new forever home! There was not a dry eye in our rescue organization when we all heard Chevy was adopted and finally, loved by her new family. It is with un-imaginable sadness and heavy hearts that Chevelle passed into Rainbow's Bridge in March of 2011. We, at BCIN, feel as tho we have lost our personal girl. Our hearts go out to her adopted family who have shown that, no matter the circumstances, there are still those who have un-conditional love for sweet little souls such as Chevy. Chevy has taken a piece of all of us with her and in return taught us to never, ever give up on even one little soul. She has once again, taught us that we are all worthy of love. In the end, she was surrounded with love, and we know, she knew how much she meant to us and we will always love little Chevy. In honor of Chevelle, please support rescue organizations, for without them, Chevelle may have never found her forever home. So, dear Chevelle, know you were loved so much by so many, you made a difference in this world, rest in peace, and au revoir.. until we meet again at Rescuer's Rainbow Bridge, Sweetheart. AND I WILL NEVER FORGET YOU OR STOP MISSING YOU. YOU WERE SUCH A BIG PART OF THE FAMILY FOR SO LONG. Copyright © 2019 Border Collies In Need, Inc. All Rights Reserved.